…And why should you learn from me? Here are a few facts that might matter to you when considering me as your teacher. When I discovered the art of fruit carving and got very excited about it. (Farther down this page, you can find out how cancer led me to fruit carving). I now love it. But in the beginning I found it frustrating to not know how to get started getting good effective instructions using fruits and vegetable common in the US with instructions in English. That is how I got started offering video lessons. I wanted to make it easier for other to enjoy vegetable and fruit carving without all the wasted time and money I spent. Since my humble beginning, I’ve now appeared on TV, won fruit and vegetable carving competitions and my work has been featured by People Magazine. I’ve been a professional judge a couple of times at the U.S. Collegiate National Championships Vegetable and Fruit Carving. I’ve even had the honor of carving pumpkins at the White House for the first family’s Trick-or-Treat event. I now have thousands of happy student/customers of my video lessons all over the world. It’s been so rewarding to hear how much joy carving has brought to so many lives. You can see what some people have said here. OK, I don’t mean to sound like I’m bragging. I just want you to know that I know fruit carving and have been successfully teaching it to others through my video lessons. Now, let me tell you a story that answers what people ask me the most often. After wasting lots of money and time struggling to learn fruit carving, I wanted to make it easy for others to learn the art of vegetable and fruit carving. When I first discovered fruit carving, I didn’t know quite where to start. I wasted a lot of time and money learning by trial and error. I could not find good fruit carving books in book stores. The books I found showed how to do basic garnishes only. The books I eventually found online seemed great until they arrived in the mail. Some had super childish projects and others had written instructions and photos that were nearly incomprehensible when you don’t yet know the basics. Nita carved pumpkins at the White House for the first family’s trick or treat event. Although that makes sense to me now, at the time, it wasn’t helpful at all. Even with the photos. Still other book showed carving that required odd tools that I could not find anywhere. It was frustrating! When I found a video, it was in Thai with English subtitles and demonstrated with vegetables and fruit I’d never seen in the USA. Besides wasting money on books that were not very helpful, I wasted more money on tools. Some of them were good and some were lousy quality. Others simply did not do what they were supposed to. After much wasted money, time and frustration I found a couple of wonderful Thai teachers. Thailand is one of the countries best known for beautiful fruit and vegetable carving. Carving become easy once I was shown how. What a difference! Since then, I’ve learned to carve well. I find carving creatively satisfying, relaxing and I love hearing the oohhs and aaahs. I wanted to make it easier for others to learn to carve without the expense of trial and failure that I experienced. So set out to create step-by-step video lessons that make it easy to successfully carve fruits and vegetables. When you are show how to carve, It makes so much more sense than trying to learn from photos and words in a book! That is what I now do. I show you how step-by-step in my video lessons. If a picture is worth a thousand words, than video with voice is worth a million words. If you have an interest in learning fruit and vegetable carving and are shown how, you will see that it can be easy and not nearly as difficult as you might think. But, your friends and family won’t know that and they will think you are an amazing and talented artist. You won’t have to tell them any different. Hee Hee. That can be our little secret. After I learned vegetable carving from being shown how and by doing what I was shown, I later discovered that all my books became so much more useful. Well not all of them. One was still too childish. When I looked at the carvings in the book that was selling lots of tools, I realized that I now knew how to get most of those results without needing a whole bunch of specialized tools. Just a few essential tools are all that is needed. As part of the my course, I introduce you to and show you how to use the most useful and versatile tools and knives. If you want to learn vegetable carving you’ll enjoy my Vegetable and Fruit Carving 101 Course . With it, you will be having fun and impressing your guests with your amazing carvings in no time. Through my video lessons, I’ve now taught thousands of people all over the world how to carve fruits and vegetables. My student/customers are everyday people who like me, enjoy crafts, cooking, and/or entertaining. Many are chefs, caterers and culinary students. People from all walks of life find fruit carving to be a fun and creatively satisfying hobby. What does cancer have to do with fruit carving? A lot of people ask me how I first discovered the art of fruit carving. Here is my story. I have enjoyed baking even when I was very young. I always wanted an “Easy Bake Oven”. Those of you around my age will remember the Easy Bake Oven. I never did get one but my mother gave me a gift of some tiny cake size baking pans and small cake mix packets. She helped me to bake them in a regular oven. Later, as a teenager, I loved to bake. I made and sold my home made cookies on a lunch route where I brought baskets full of sandwiches and salads to businesses daily. My cookies got to be very popular with my customers. In my adult years, I learned to love cooking and entertaining and giving parties. I like making my guests feel special. 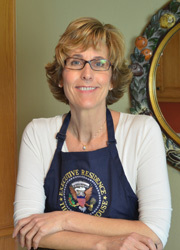 Over the years, I’ve enjoyed taking cooking classes and devoured lots cook books. My recipe file was particularly full of dessert recipes. Why Vegetable and Fruit Carving? Throughout the years, I enjoyed making special birthday cakes for family and friends that I love. One year, a loved one’s birthday was approaching and we planned to have her over for dinner. I wanted to make her a cake that she would enjoy. Pineapple upside-down cake is her favorite. But, this year was different. She had just discovered that she had cancer. 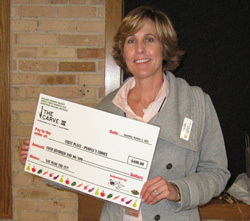 In an effort to improve her immune system, she had drastically changed her diet. She was not eating flour or any kind, sugar, milk and other ingredients that are normally found in cakes. She was only eating some fruits, some vegetables and fish….not ingredients typically found in cakes. How was I going to make her a cake? The day before she was to celebrate her birthday with us, my loved one told me how she had celebrated her birthday with her children and grandchildren the previous day. Her daughter who is an excellent cake baker had made a beautiful cake for her birthday party. Everyone enjoyed the cake but the birthday girl, was unable to eat it. My loved one told me that it was a beautiful cake and she wanted to eat some but couldn’t. Her health was more important. Still, she felt a bit deprived. I kept asking myself, “What can I make instead of a regular cake”? I wanted to make a birthday dessert that she could eat and that would be festive. So, I came up with the idea of making a cake made of watermelon and fruit. I cut a watermelon into a cake shape. I decorated the sides with pineapple ring swags topped it with pretty green honeydew melon balls. It turned out to be an adorable, colorful, happy cake. Once I positioned it on a cute white pedestal cake plate and put candles on top, it was a perfect birthday cake made of only fruit. My guest of honor loved it. Everyone talked about how cute it was. After she took pictures of her “cake”, I cut it up into cake slice pieces and everyone ate it off their plates just as you would eat cake. There were lots of laughs. We all had fun with it. Several times over the next following months, that cake came up in conversations. When introducing me to a few different new friends, my loved one told them the story of the watermelon cake I made for her and she showed them the photos of it that she had taken. So, over all it was a big success. It was fun and easy to make, a delight to present, tasty to eat and memorable for everyone. And best of all, it gave me a way to make her feel special and honored on her birthday. After that, I was inspired to start looking into all the different ways I could make fruits and vegetables into exquisite flowers, centerpieces and garnishes. So many of my friends and family members are health conscious eaters and a few are athletes so they loved my new fruit creations. Carving fruit became a great substitute for fat filled, sugary desserts. Whenever I brought my vegetable and fruit carvings to dinners, people always ooohed and aaahhhed and complimented me. I was always amazed at how easy it was to create these little “works of art”. Soon, people were asking me to teach them and encouraging me to do it as a business. I am not a professionally trained chef, just a woman who likes to cook and entertain. 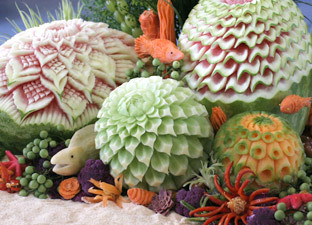 But, I thought that there must be others like me who would enjoy the creative fun of fruit and vegetable carving. And the admiration of guests, friends and family is a pleasant bonus. Now, I have taught people all over the world how to get great results with fruit carvings through my video lessons. I’ve been a repeat judge at the U.S. National Collegiate National Championship and have won awards in various carving competitions. 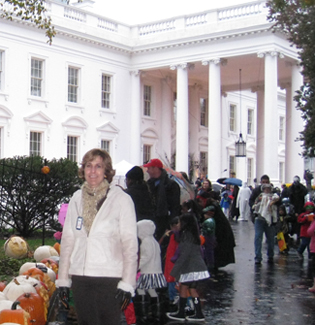 I have even had the honor of carving at the White House for their Halloween event. 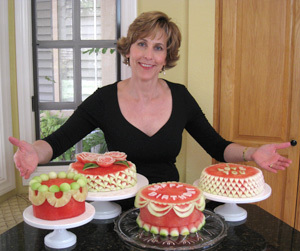 Nita with several styles of watermelon cakes. Since that first watermelon birthday cake, I have learned lots of techniques used by professionals that I will share with you. With my Fruit and Vegetable Carving Course, not only will you create your own edible works of art, you’ll hear lots of “WOW”s from your family, friends, and guests. Like me, I know that you will be amazed at the what you can do. When you are shown how, you’ll find it’s easier than you may think. You will be proud to display your centerpieces, garnishes and fruit displays. You’re carvings will be something people remember and talk about. Fruit and vegetable centerpieces makes great gifts, too. All it takes is being shown how and then doing it yourself. And that’s exactly how you will learn in my Vegetable and Fruit Carving Course as well as my other video lessons. My step-by-step videos show you exactly how to carve.You will be surprised at how easy and how creatively rewarding it can be. You’ll see. P.S. Ooohs and Aaaahs are guaranteed. P.S. To get a free sample lesson that shows how to make a lovely radish bouquet centerpiece, go to //www.vegetablefruitcarving.com and sign in. P.P.S. 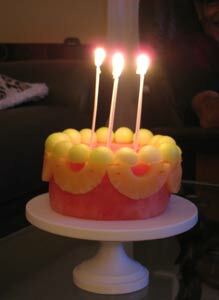 To get a free lesson showing how to make your own watermelon cake, click here.